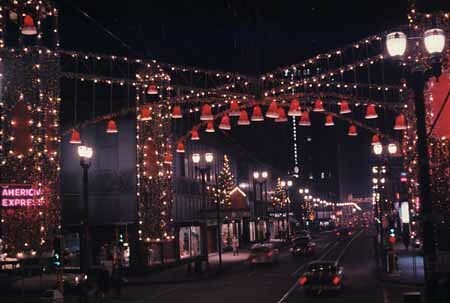 In the late 1950's and early 1960's as new suburban shopping centers lured shoppers away from Downtown St. Louis retail several intersections received these lavish decorations in an effort to turn the district into a winter wonderland during the holiday shopping season. 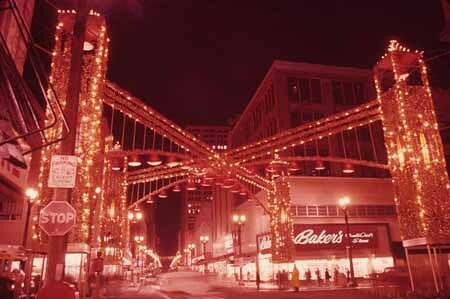 Another view of decorations at 6th & Washington looking south. 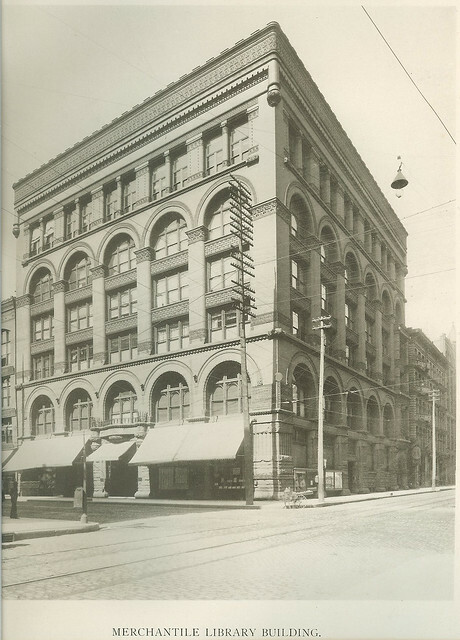 The Railway Exchange Building, home of Famous Barr (now Macy's) can be seen at the center of the photo. 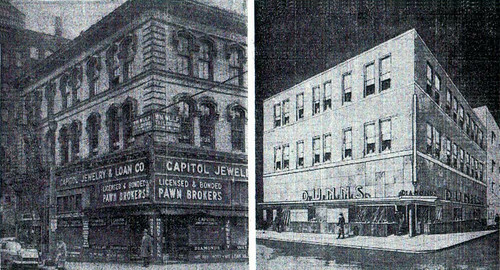 Stix Baer & Fuller was located at the northwest corner of the intersection. 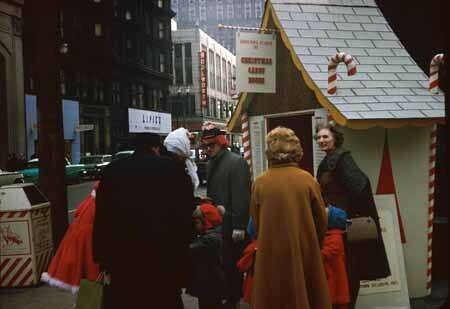 This portable Christmas Candy House, was located at the corner of 8th and Locust. 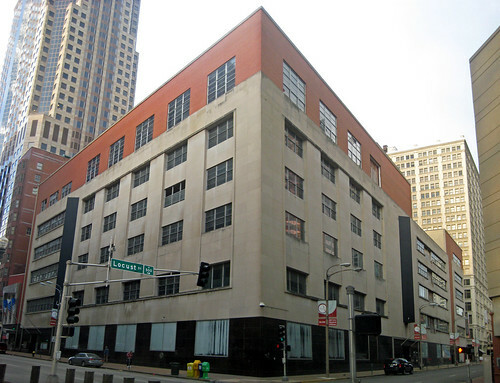 Looking south beyond the Chemical Building, the white four story terra cotta building is now the location of the Laclede Gas tower built in 1968. 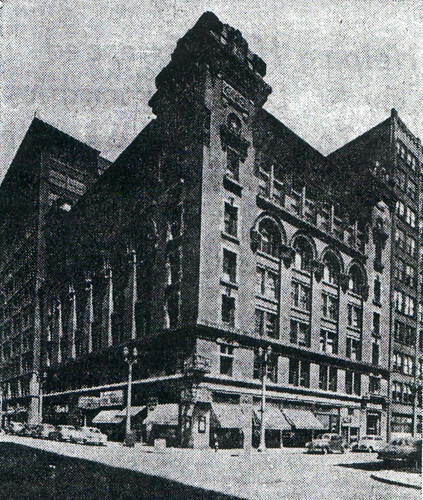 The building seen beyond at the southeast corner of 8th & Pine was demolished in 1977 for an addition to the Wainwright Building. 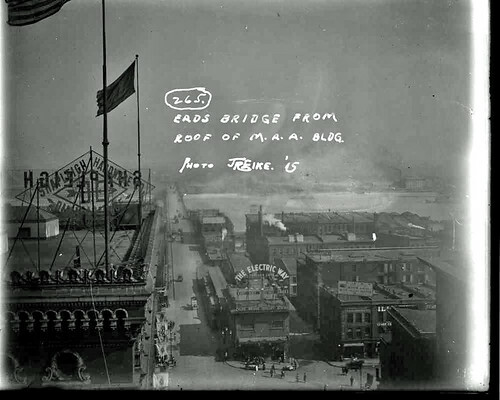 Photos above from the Western Historical Manuscript Collection. 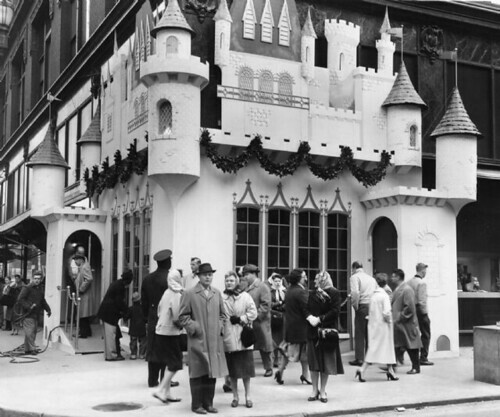 In 1959 Stix Bear & Fuller constructed this fanciful Christmas castle at the corner of their store at 7th & Washington. 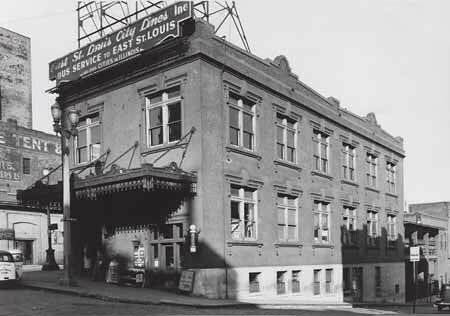 Next year the former SBF building will re-open following a top to bottom renovation housing an Embassy Suites Hotel, apartments, ground floor retail and hopefully a Blues Hall of Fame. Photo from the Post-Dispatch. 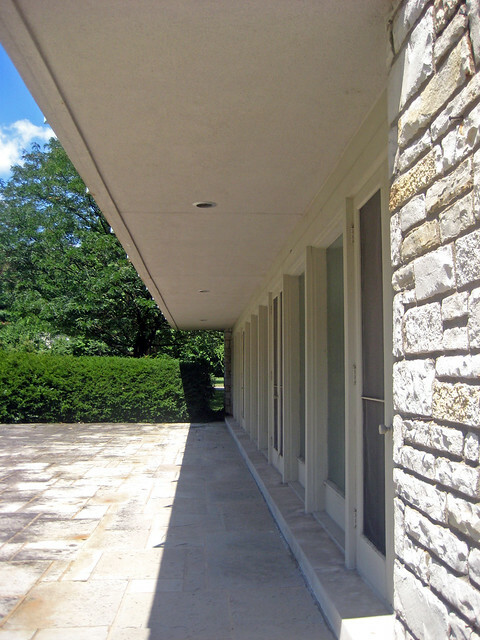 About two years ago I posted the story of the demolition of Morton D. May's Ladue estate, the 1941 International Style masterpiece by Samuel Marx. This holiday season though I have the pleasure of bringing fantastic news! 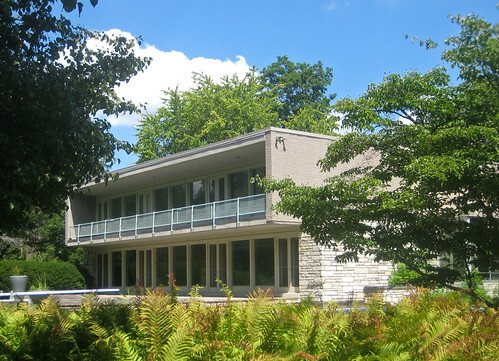 Yesterday I received the following anonymous comment regarding Morton D. May's second modernist home in Clayton: "Hi Paul! My husband & I recently purchased 12 Brentmoor Park. 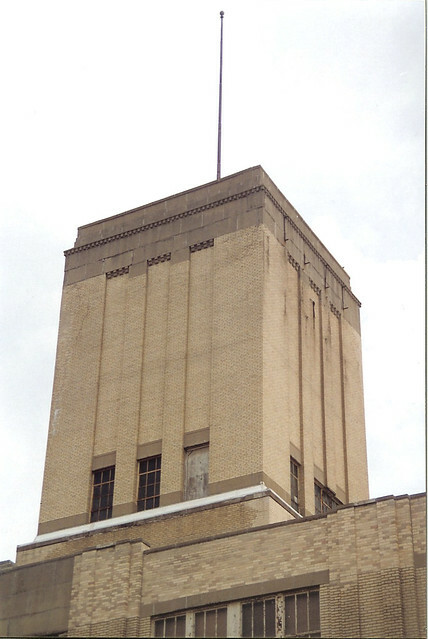 You will be happy to know that we plan on lovingly restoring it, NOT tearing it down. Thanks for highlighting some local gems!" 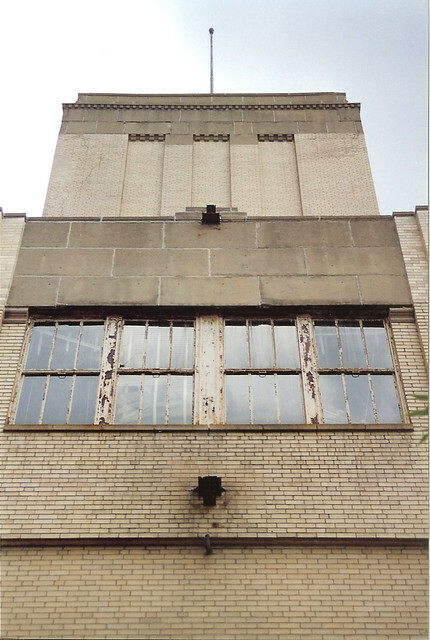 Earlier this year, May's Brentmoor home had been listed for sale as a potential tear-down. While the house was in very good shape on the exterior, its semi-gutted interior did not point to a very positive future. Fortunately a couple with the vision to preserve this modern beauty has bucked the trend of destruction for fake castles. 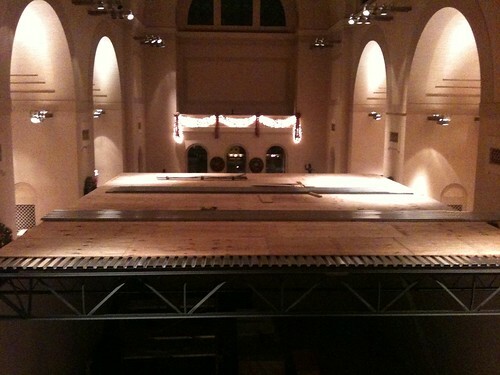 To this I can only say THANK YOU! Friday evening I finally went to the St. Louis Art Museum to check out the Joe Jones exhibit, which is excellent and I highly recommend everyone see it. As I walked through the glass front doors facing Art Hill into Sculpture Hall though I was somewhat unprepared for what I would encounter. Immediately I saw the plywood wall in front of me and at the same instant sensed the absence of the sound which I have enjoyed in that space all my life. The fountain was gone! I was aware of the plan to remove the fountain, but was still somewhat caught off guard as I had not been inside the museum for several months. I had gone to a few of the public presentations about the museum expansion and knew that others shared my displeasure with the idea of moving the Neptune fountain out of Sculpture Hall. I had hoped that maybe there would be enough public outcry that the museum might change their plans, however that obviously didn't happen. 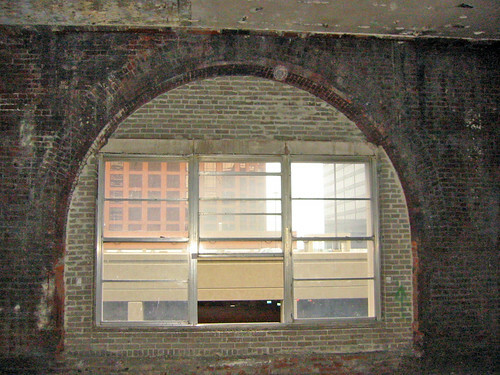 Beyond the plywood wall around the scar in the marble floor where the fountain was located the entire south end of the hall has been walled off and a temporary ceiling is being constructed above. 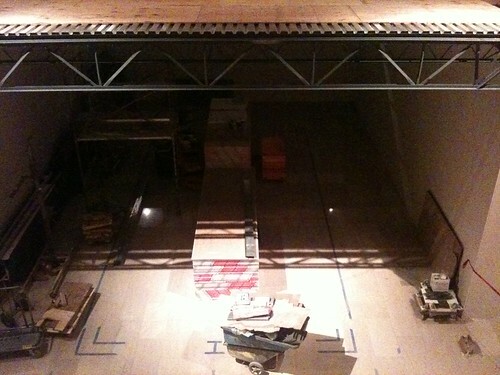 This is presumably so that construction can occur on the new grand staircase to a new lower level hallway leading to galleries and the south building where the restaurant gift shop and auditorium are located. 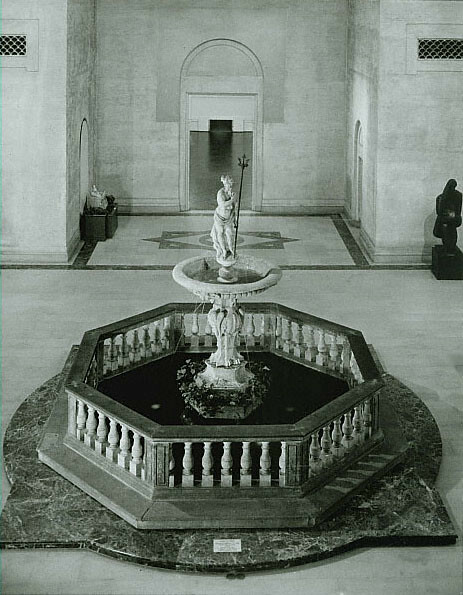 The location of the grand staircase centered in Sculpture Hall (outlined by the tape lines) was likely the reasoning for removing the fountain, because of course you couldn't have a fountain as the focal point at the top of the new grand stair, right? 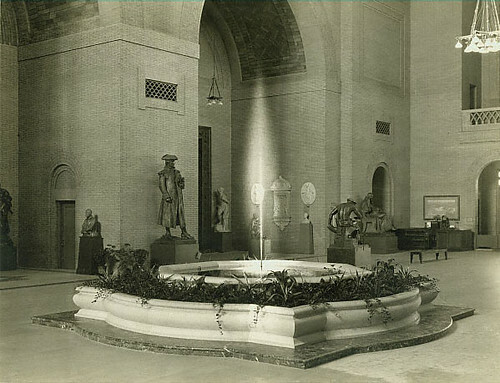 The Neptune fountain as it stood welcoming generations of St. Louisans until recently at the center of the hall. 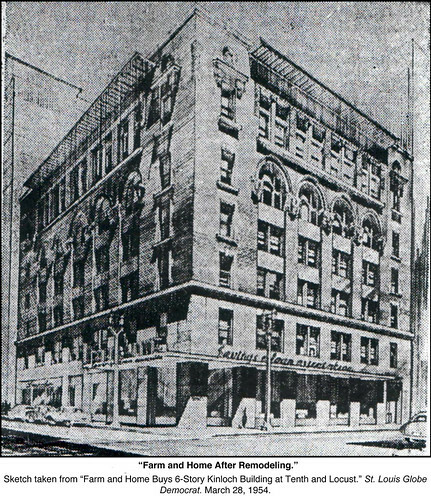 According to a fact sheet about expansion on the museum's website, the fountain will be relocated to a new group entrance at the South Building. 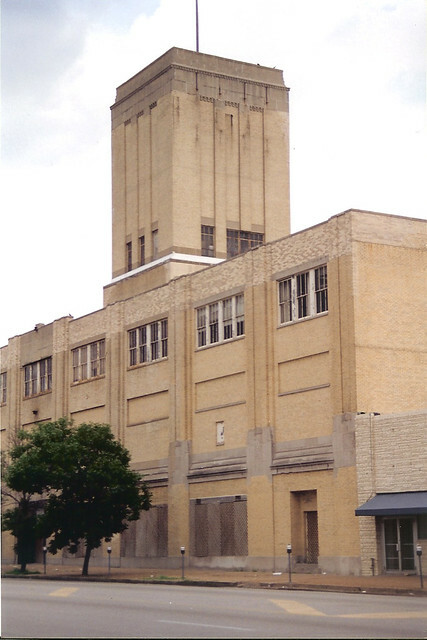 Since public parking will be concentrated in the new garage under the addition and on the existing surface parking areas flanking Art Hill, most visitors with the exception of school children and bus tours may never enjoy the fountain. The Neptune fountain was not the first in this location. 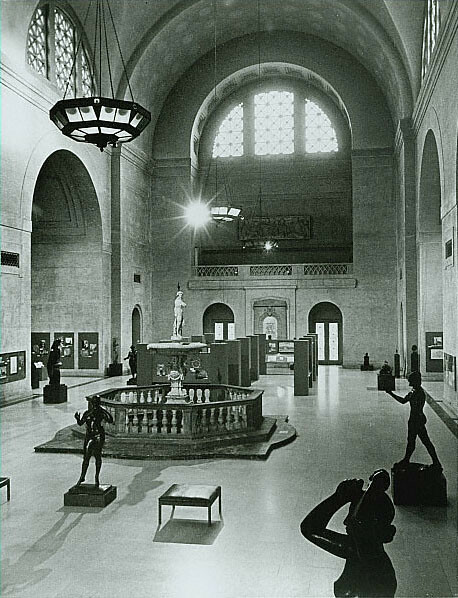 This fountain designed by architect Louis LeBeaume, who with Eugene Klein designed the Kiel Auditorium & Opera House, was installed at the center of Sculpture Hall in 1928. 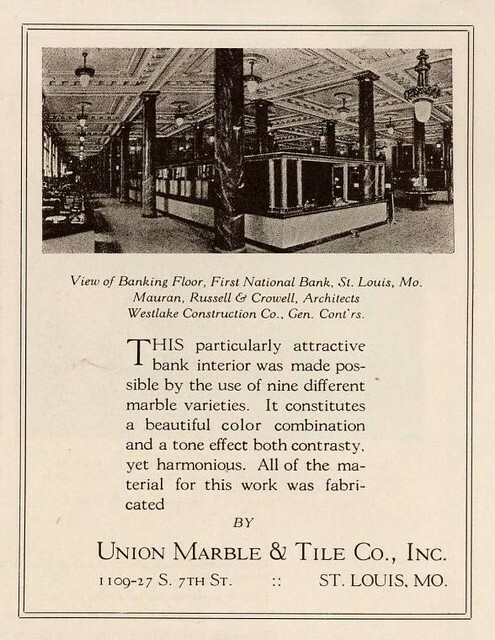 The halls marble floor, also designed by LeBeaume, was installed in the same year. 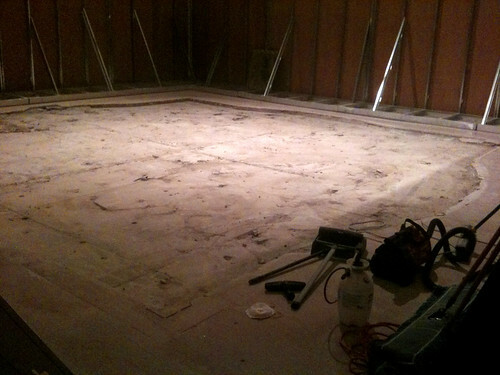 Prior to that time the floor had been bare concrete. 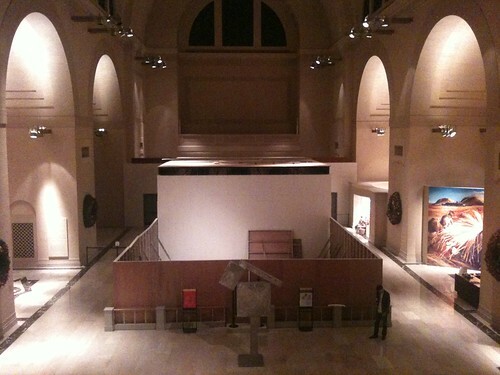 In the photo above, you can see the finish of the walls and ceiling of the hall as they were when the museum was constructed prior to the 1904 Worlds Fair. 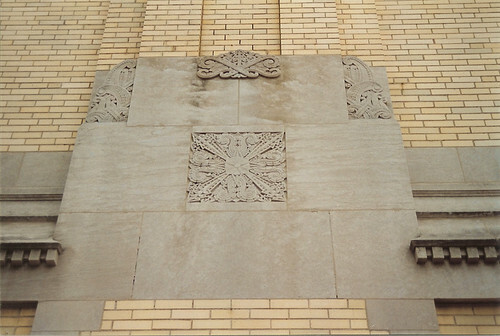 The walls were buff brick and the panels of the barrel vaulted ceilings were a herringbone patterned brick or tile that resembles a Gaustavino ceiling. 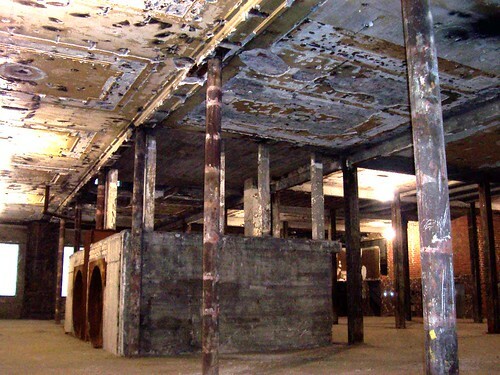 By 1950 the original walls and ceilings had been covered over with a cement or plaster parging, still present today. The Neptune fountain by Renaissance sculptor and architect Bartolomeo Ammanati replaced LeBeaume's in 1958 although the the marble base for the former was retained. 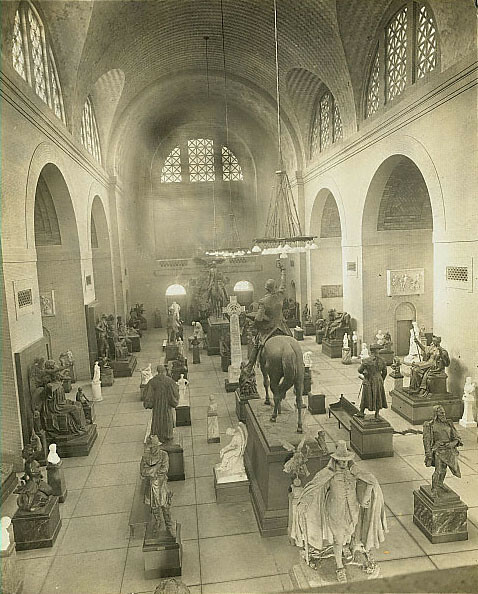 From the time of the fair in 1904 through about 1920 photos show Sculpture Hall packed with a seemingly ridiculous number of works. 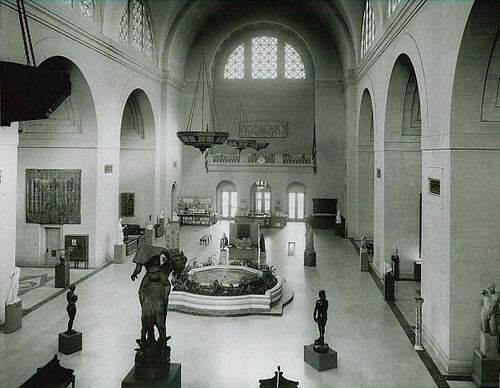 This type of crowded presentation for both sculptures and paintings was common practice for museums at the time. 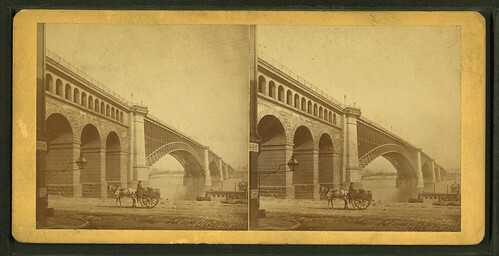 All historic photos from the St. Louis Art Museum's history page. 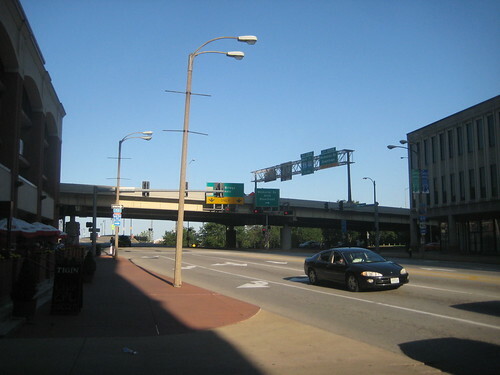 Washington Avenue from Memorial Dr. to the riverfront. Photo by Melinda Stuart. 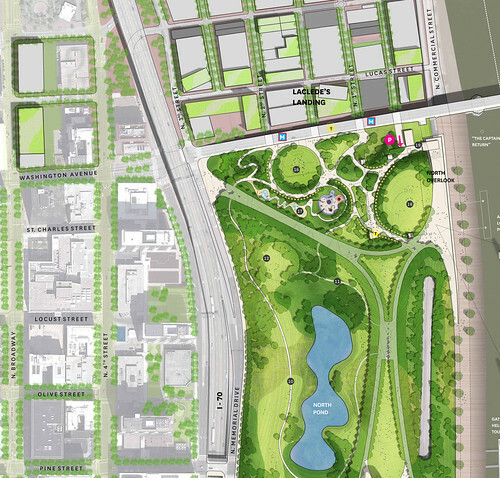 As you are probably aware, MVVA's plan for the arch grounds, illustrated below, calls for removal of Washington Avenue east of Memorial Drive to the riverfront and extension of the park to the south face of the Eads Bridge. 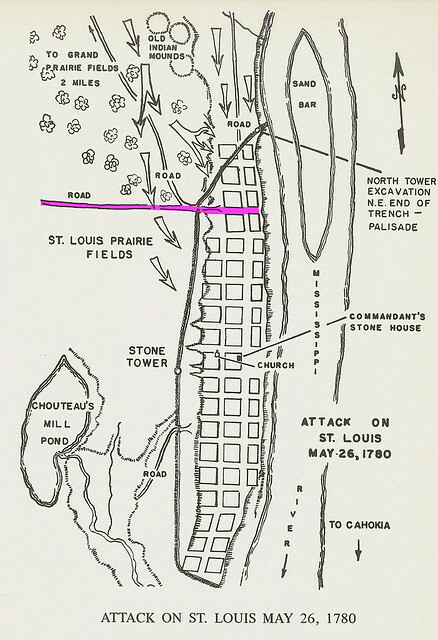 Although one of the top goals of the City+Arch+River Design Competition was to improve connections, MVVA's plan will effectively create a blockade at the south end of Lacede's Landing. 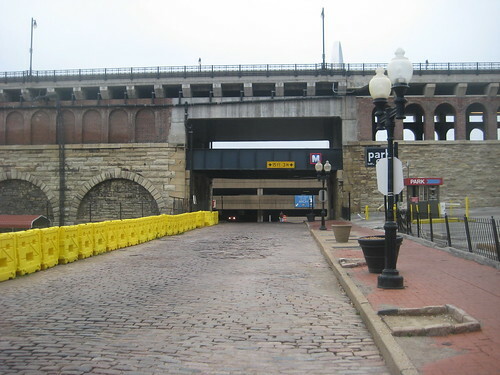 While I am always an advocate for better pedestrian realms, and of course there is the MetroLink at the Eads Bridge, the fact remains that many come and go to Laclede's Landing by car. 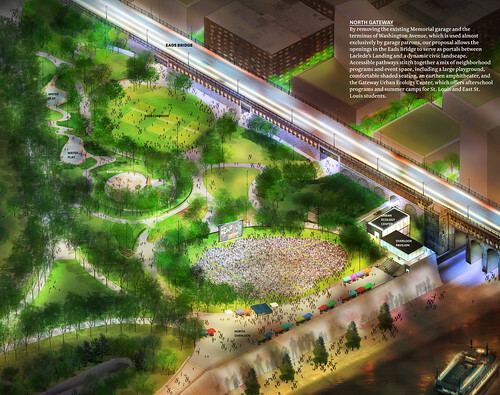 MVVA'a plan for the "North Gateway" for the most part simply provides redundancy for functions that already exist in the park, including two new gathering spaces. 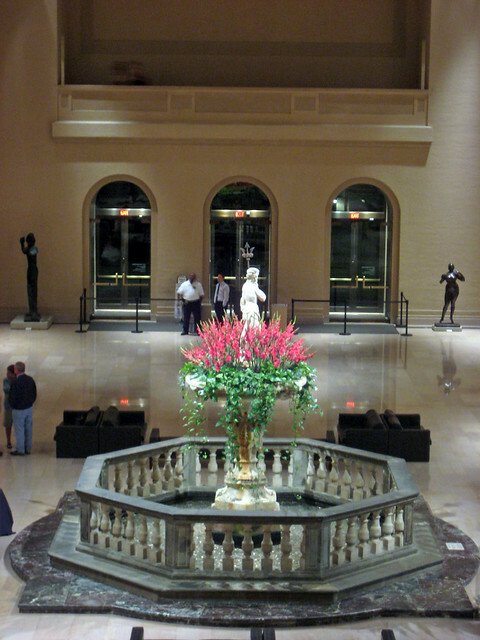 The large central lawn under the Arch as well as the Arch grand staircase are regularly used as gathering spaces for concerts, rallies and other public events. Are two new gathering lawns really needed? 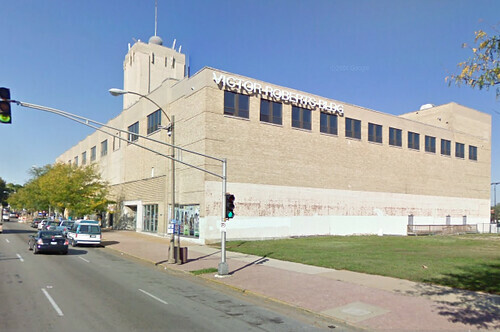 Not only does MVVA's plan block access along the Washington Avenue corridor to the riverfront for autos, but the proposed new "Urban Ecology Center" that would be built largely within the Washington Avenue street right-of-way would block direct access to the river for pedestrians and cyclists as well as create a visual barrier for all. The design narrative states that people would be able to access the riverfront via an elevator within the Urban Ecology Center. 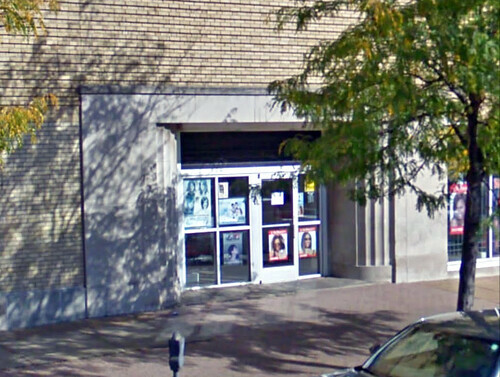 This is good to provide a vertical means of accessibility, but bad for all when the building happens to be closed. 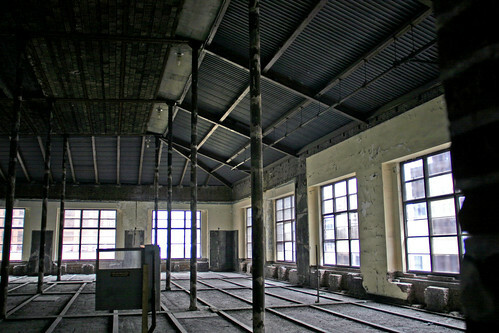 I wonder how the NPS will feel about people dragging their bikes through the building? The placement of the ecology center and providing access and usable spaces at the lowest level, essentially at the top of the levee will have some technical issues as well. 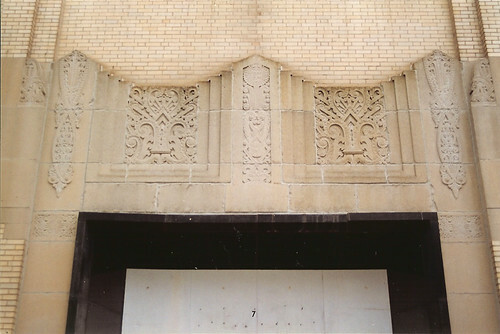 According to the photos below that I took in June 2008, they could be inundated by flood waters. 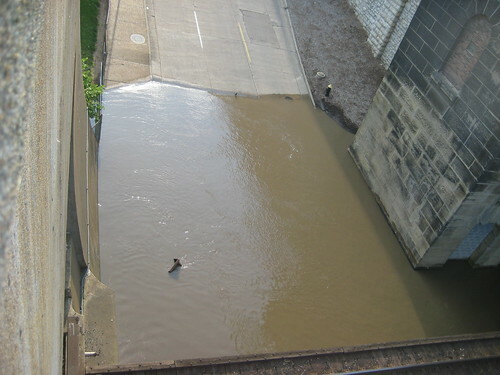 High water during the the flood of 2008. 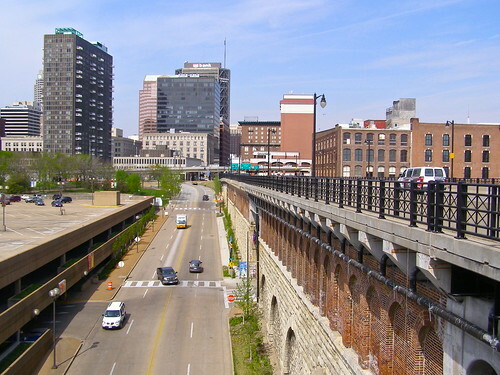 The traffic pattern proposed by MVVA for visitors coming to the north end of the Arch is far from intuitive, and for those coming from the south or west, downright confusing. 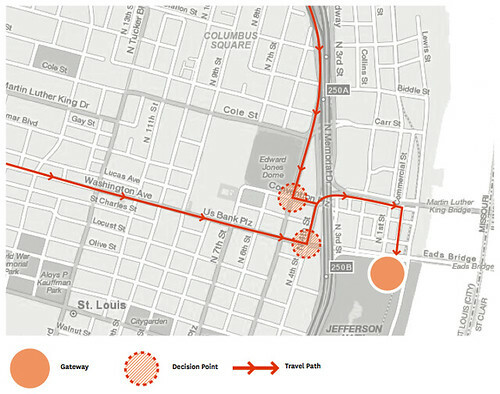 This same singular path would remain as one of the few remaining ways to access Laclede's Landing by car. 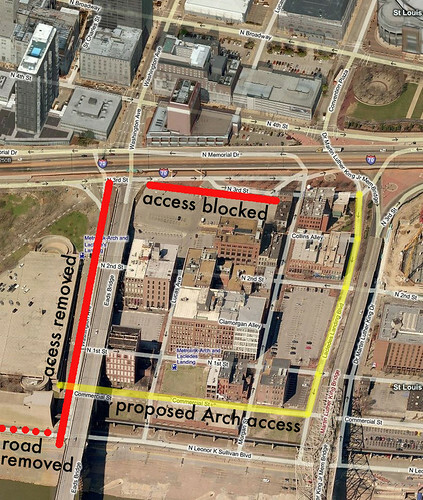 The proposed Arch access and default Laclede's Landing access would be the north edge of the Landing along the MLK Bridge. 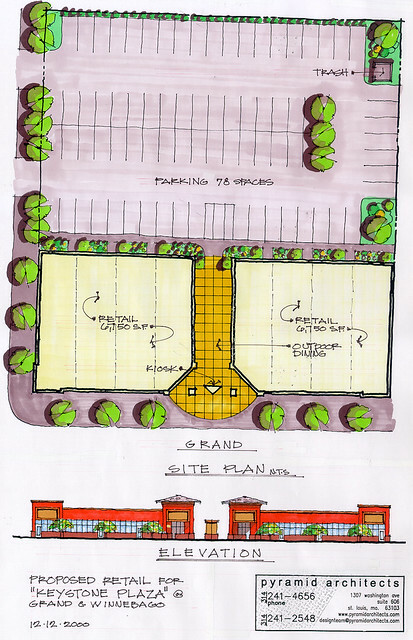 Access to a re-built new north Arch parking garage is proposed to be Commercial Street, which is basically a glorified alley. 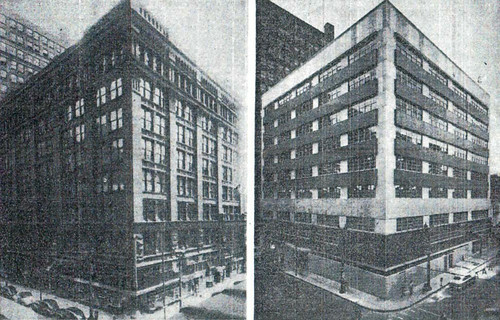 The few original buildings face their backs to the "street". 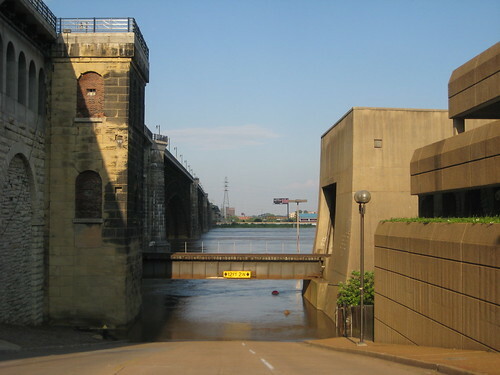 First and 2nd Streets on Laclede's Landing would be blocked at the Eads Bridge creating dead end streets south of Lucas. 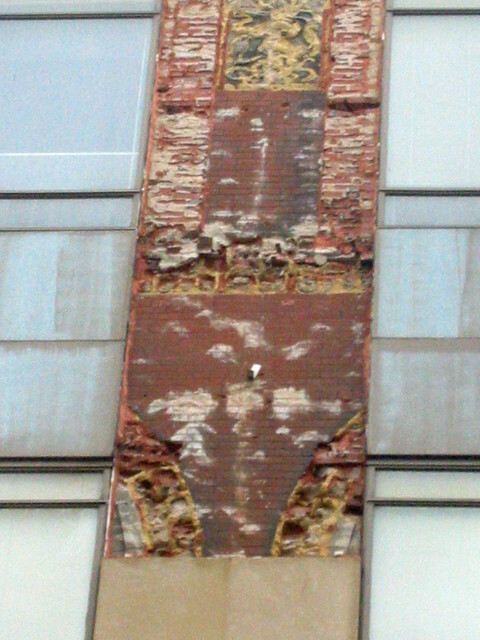 The demolition of the Switzer Building on First Street, to the left of the yellow barricade in the photo above, has left that block lifeless with no building frontage. 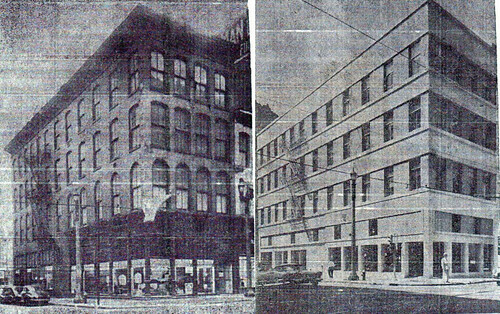 Second street retains half of its original buildings but unfortunately faces a parking lot to the west. 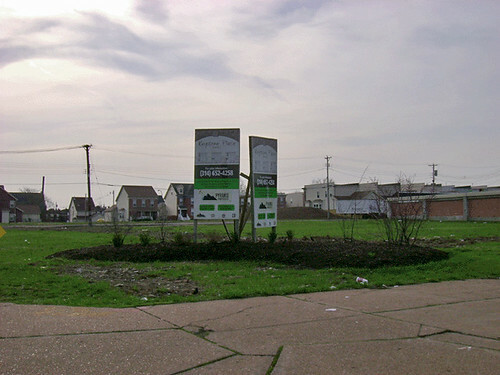 These vacant lots failed to draw development of new in-fill buildings during one of the best real-estate markets in history that ended a few years ago. Dead ending these blocks would surely doom them to permanent desolation. 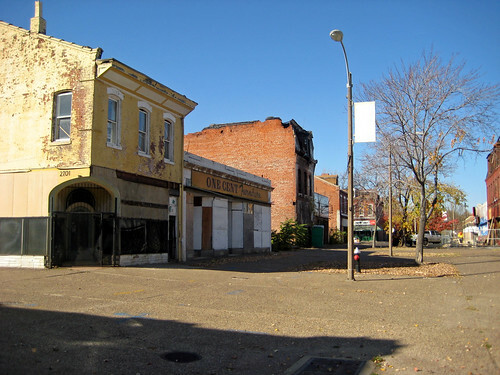 Some say that these two blocks could just be turned into pedestrian streets. Really! 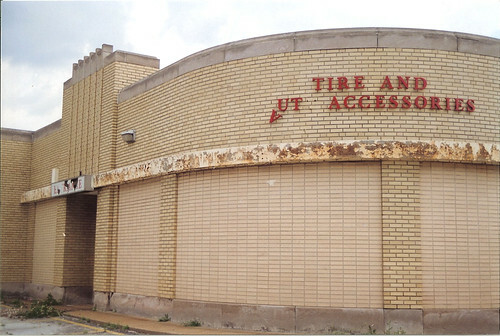 !, pedestrian streets? We tried that along with many other communities across the nation and the majority failed miserably. 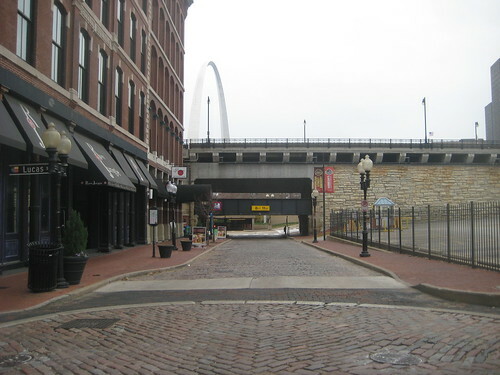 Lets face it, Laclede's Landing has been struggling for over 25 years largely due to its isolation. The galleries and cute retail stores all closed or moved elsewhere not too many years after opening in the early 1980's. 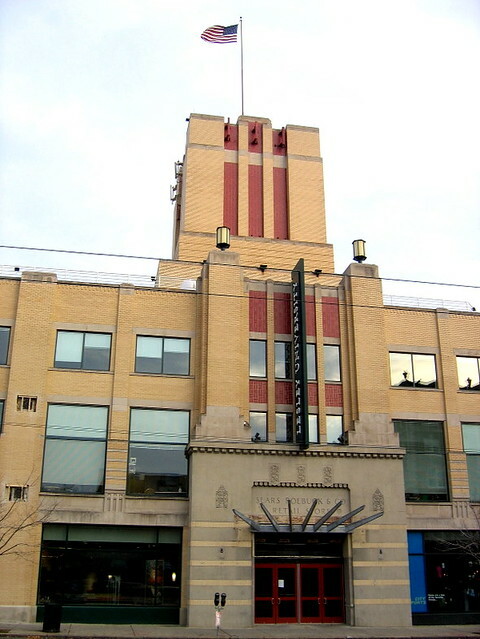 What's left is largely the nightlife scene: bars, a few restaurants, the casino, offices, oh and the creepy wax museum. 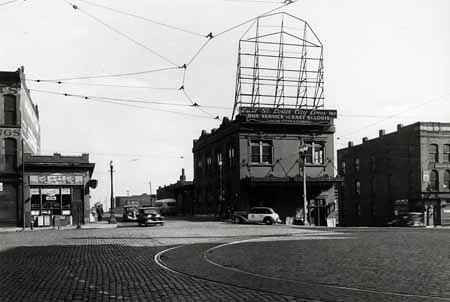 Removing Washington Avenue and access to Laclede's Landing from the south would be the equivalent of kicking it in the teeth when its already down. 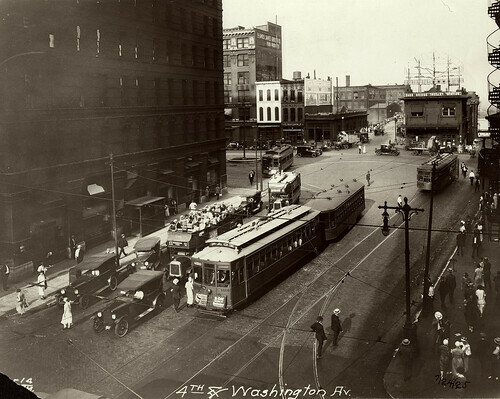 The 14th Street Mall was created with the intent to revitalize the street but ended up as a virtual ghost town as did pedestrian streets almost everywhere. 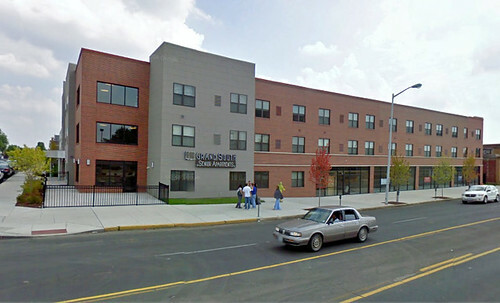 Fortunately 14th street has recently been re-opened to traffic and its buildings newly renovated. 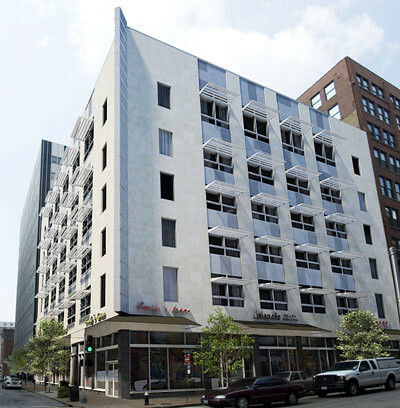 Laclede's Landing already has the feeling of a district on life support, hopefully during the 90 day design refinement process of MVVA's concepts now over half complete intelligent decisions will be made not to pull the plug on Washington Avenue and the Landing.